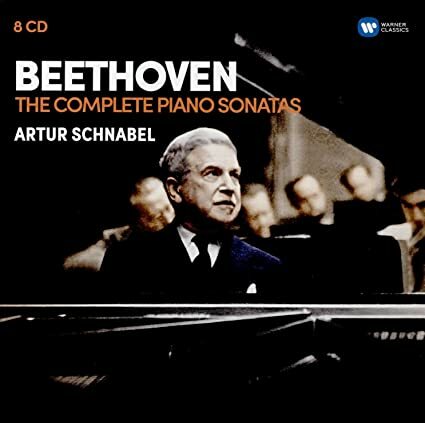 One of the most legendary pianists of the past, Artur Schnabel, who is an absolute favourite of yours truly, has had available almost from the beginning in the 1930s his rendering of Beethoven's 32 piano sonatas. Released on LPs for many years, they naturally made their way to compact discs. HMV/EMI made the original recordings, and other minor labels even issued these same performances. Naxos also issued them on their now intermediate-priced label. Since the takeover of EMI, Warner Classics has been remastering many of these recordings using the new technology of the day. Now, they have just reissued the "32" under their own logo [97505, 8 CDs, ADD]. These were remastered in 24 bit, 96kHZ in 2015-2016 from the original 78 discs. Each CD runs between 71+ to near 80 minutes. Recorded between 1932 and 1935, Schnabel's beautiful Bechstein (his preferred piano) breathes new life to us with more clarity than ever thus preserving the unique tonal properties that made the Bechstein so preferable among the great pianists at that time whose repertoire was pimarily Classical period. Most of us piano aficianados had/have the original LPs, the already issued CDs, etc., however, the price is exceedingly reasonable for eight CDs in this newly-remastered edition. Schnabel's has been the Bible for Beethoven's "32" since they were first marketed. A booklet accompanies this excellent new release. HIGHLY recommended. I've been listening to this new release over the past few weeks and I feel that the results are mixed. I am impressed with the intensity and dynamics of Schnabel's playing. The wide range of soft to loud and sforzando attacks are very natural sounding. On the other hand, the warm lower octaves seem to be reduced here when compared with the earlier EMI issue. I listened to some of these sonatas 30+ years ago from 78s and recall the beauty of Schnabel's piano tone albeit with a lot of noise, a bane of English pressed discs. Schnabel's finger work is revealed with exceptional clarity against a fairly silent backdrop in this new release. I've done a lot of the listening through headphones and I find the earlier EMI transfer is brighter overall than this one and sometimes that brightness sounds a bit harsh. In this new release, that harshness is gone. Through speakers both transfers sound a bit dull to me, with the earlier EMI sounding slightly better. The layout of this new set is identical to the earlier one. At first that made me suspicious this was a re-mastering of the earlier Hardwick transfers, perhaps re-equalized. Only Sonata No. 5 is a new transfer deriving from 78 RPM discs provided by the EMI Archive Trust--at least that is what the booklet states in spite of its mention of new transfers from the "original 78RPM discs". No credit is given for the transfers and no other sources for discs is mentioned. One listener pointed out on a newsgroup that the first movement of the Sonata No. 15 ("Pastoral") at 7:45 is about 25 seconds longer than earlier issues. While apparently slightly lower in pitch from earlier transfers pitch alone doesn't account for such a timing difference. I also noticed that the third movement of Sonata No. 30 is 14:03 in the earlier EMI set and 14:14 in the new one. Also the background noise characteristics are different for these movements confirming this is a new transfer. This has led to speculation that different, perhaps unauthorized takes, were used in these transfers. What takes Schnabel may have approved are unknown. He certainly approved those issued, but the need to have alternates in the event of accidental damage during plating or manufacture was something the companies had to think about. I also understand that companies would press replacements for broken discs for individual sets, and inadvertently issued alternate takes to savvy customers. I haven't heard the Naxos or Pearl transfers and don't have any desire to acquire them (I'd consider the Naxos if it was issued complete in a slim box, but for some reason Naxos has chosen not to do so). I plan to rip these to my phone which also has a graphic equalizer so I'm hoping I can restore some of the warmth of Schnabel's piano from 78s as I recall it (admittedly dim after so many years). David Bloesch's definitive Schnabel discography in ARSC Journal vol. 18 shows that Schnabel recorded Sonata #15 twice, on 2/3/32 and 2/3&17/33. Why the sonata was rerecorded when all six sides had been approved as master takes, the discography doesn't say. Only inspection of the actual 78s would confirm the take number and therefore the recording session for each side. If EMI have retained all the finally and provisionally approved takes from Schnabel's recording sessions, and published both recordings or a mix of the two, the timings would be different. The situation with sonata #30 is much simpler. The published recording was made on 3/22/32 - no supplementary sessions for this music were held. There was one take only for sides 1, 3 and 4, two takes for side 5, and 3 takes each for sides 2 and 6. However, side 4 was originally split between two masters, which were "combined" to make the single published master, presumably by dubbing. If for some reason a rejected take was used in one or more EMI reissues, that could explain a difference in the timing. Of course it's also possible that the actual timings of the tracks are the same, and one or both of the printed timings are mistaken. But you've checked that, haven't you? John F wrote: David Bloesch's definitive Schnabel discography in ARSC Journal vol. 18 shows that Schnabel recorded Sonata #15 twice, on 2/3/32 and 2/3&17/33. Why the sonata was rerecorded when all six sides had been approved as master takes, the discography doesn't say. Only inspection of the actual 78s would confirm the take number and therefore the recording session for each side. If EMI have retained all the finally and provisionally approved takes from Schnabel's recording sessions, and published both recordings or a mix of the two, the timings would be different. The documentation lists 2/17/1933 as the recording date for the sonata. No take numbers are provided, just the matrix numbers 2B 2674 - 2679. I don't have the booklet for the earlier EMI CD issue for comparison. 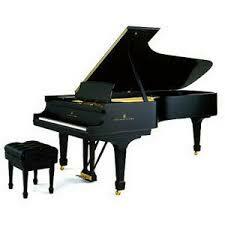 John F wrote: The situation with sonata #30 is much simpler. The published recording was made on 3/22/32 - no supplementary sessions for this music were held. There was one take only for sides 1, 3 and 4, two takes for side 5, and 3 takes each for sides 2 and 6. However, side 4 was originally split between two masters, which were "combined" to make the single published master, presumably by dubbing. If for some reason a rejected take was used in one or more EMI reissues, that could explain a difference in the timing. The timings are from my CD player. Sometimes longer tracks reflect longer silence before a track change, but that isn't the case here. It will be interesting to read professional reviews, perhaps people who have contacts within Warner or the EMI Archive Trust. Thank you, John. The information provided on the Warner discs (or booklet) is sparse on these new sets (both Schnabel and Furtwängler). A pity, because people interested in both artists would love to know what changes were made in the remasterings. I, too, have the original LPs in two editions, and the first edition of the sonatas as issued by EMI (at a premium price, I might add!). The one thing nobody has reissued yet is the last set of Beethoven's Bagatelles, Op. 119, which were issued in an HMV LP box some years ago. Thankfully, someone made a copy of the LP for me, but considering Schnabel's work with Beethoven, I would have thought Warner would be releasing this with (perhaps) some other overlooked items in the Schnabel discography. CharmNewton wrote: I've been listening to this new release over the past few weeks and I feel that the results are mixed. I am impressed with the intensity and dynamics of Schnabel's playing. The wide range of soft to loud and sforzando attacks are very natural sounding. On the other hand, the warm lower octaves seem to be reduced here when compared with the earlier EMI issue. I listened to some of these sonatas 30+ years ago from 78s and recall the beauty of Schnabel's piano tone albeit with a lot of noise, a bane of English pressed discs.